The city of León is located on a river terrace at the confluence of the Bernesga and Thorium rivers, although urban growth has now meant the city has crossed the river to the west. Barrio Húmedo (Old Town) is largely contained within the old Roman Walls and as are the majority of the most important monuments including: León Cathedral, Plaza Nueva and the majority of the city’s churches. 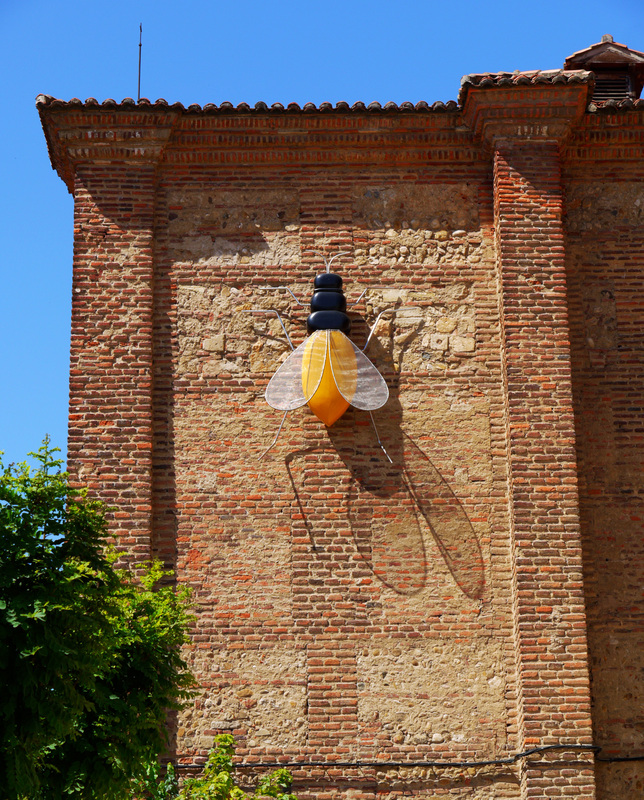 The Convent San Marcos, which is now one the finest Parador hotels in Spain, and the Castile-Leon Museum of Contemporary Art are located to the north-west a short walk from the Old Town. To the north, lies the neighbourhood of Barrio de San Memes and the University, and to the south Barrio de Jesús Divino Obrero. Information: Built in the 3rd century by the Romans in a square shape to protect the city, the walls were restored during the reigns of King Alfonso V and Alfonso IX towards the end of the 14th century. Today the remains include the Ponces’ tower, the Castle Gate, and San Isidro’s Tower. Previously there were several gates, but only one survives today in the northern part of the city, Castle Gate. Information: Popularly known as the Plaza del Grano (Grain square) due to the grain markets that were held on the square, Santa Maria of the Pilgrimage Square has been altered drastically over the years but still remains one of the quaintest public areas in Leon. 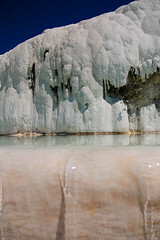 In the centre of the square, a fountain is topped with two children symbolising the confluence in the city of the River Bernesga and Thorium. 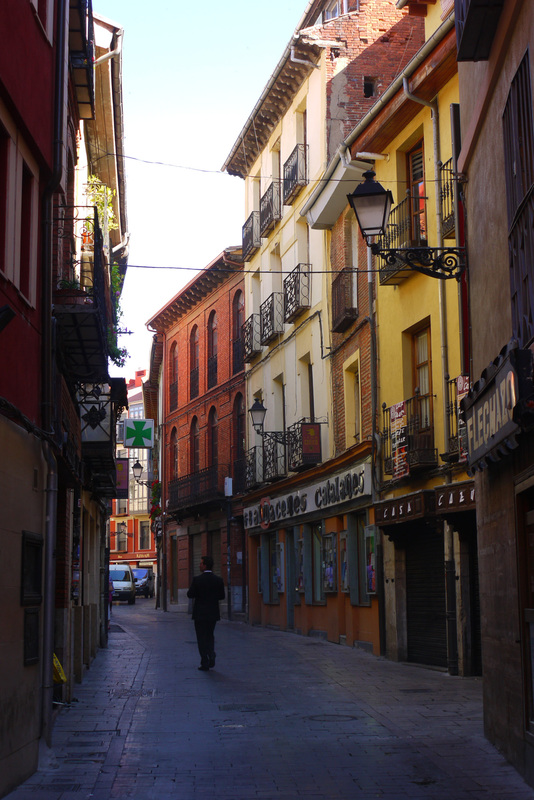 Information: Nicknamed Barrio Húmedo (The Wet District) both for the historical flooding in the area and the sheer amount of alcohol consumed in its many bars, the district is the centre of life in León. 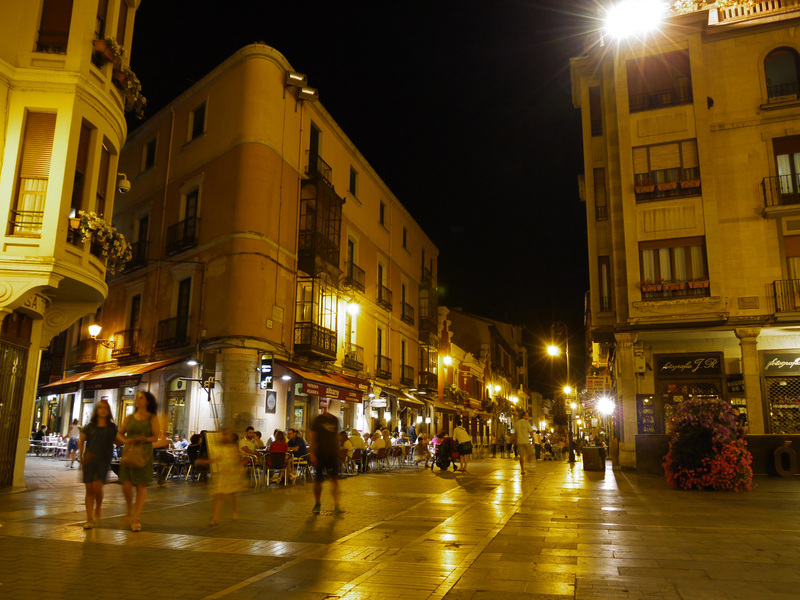 Revolving around Plaza de San Martín and the intricate network of alleys that dance around it, there are an estimated 100 bars packed into the narrow winding streets with most offering free tapas with your drink. 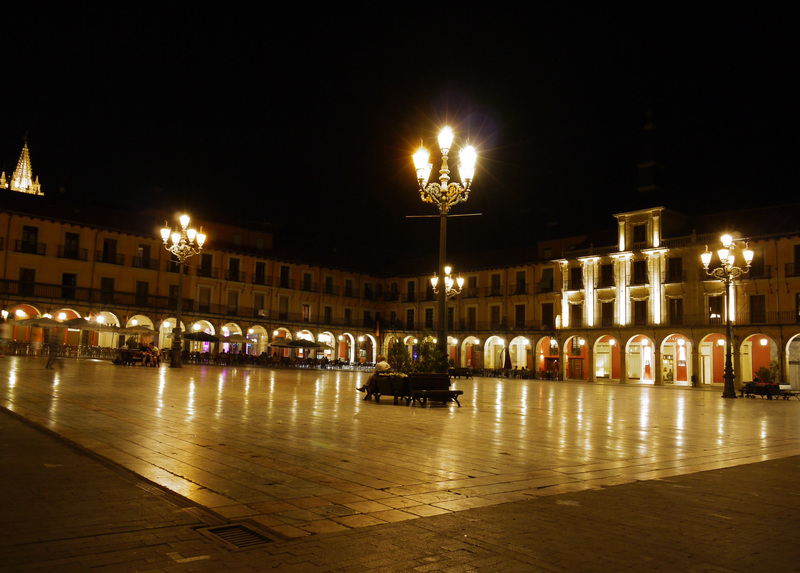 Information: Plaza Mayor is one the most beautiful and interesting squares in the whole of Spain. 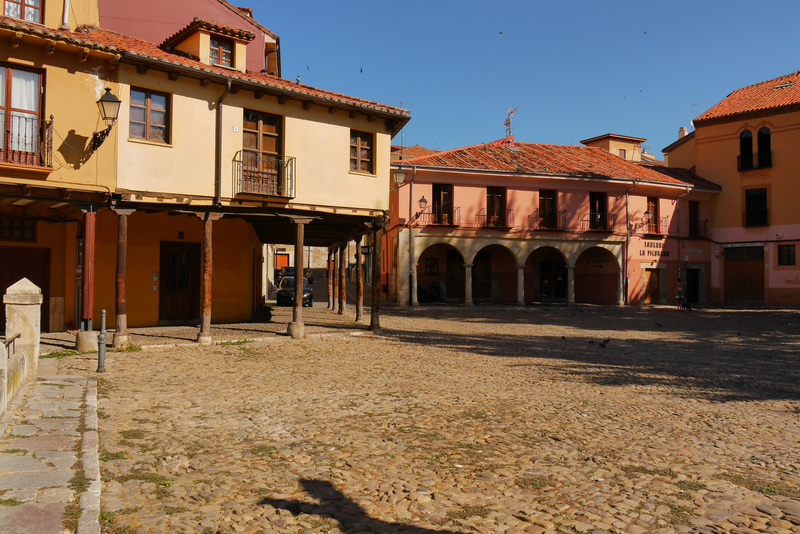 Constructed in the 17th century, the square was the scene of dramatic fighting with the French invaders during the War of Independence and has been put to many uses over the years, including as a bullring. On the west side of the square is the wonderful baroque old town hall and every Wednesday and Saturday it is home to a bustling fruit and vegetable market. 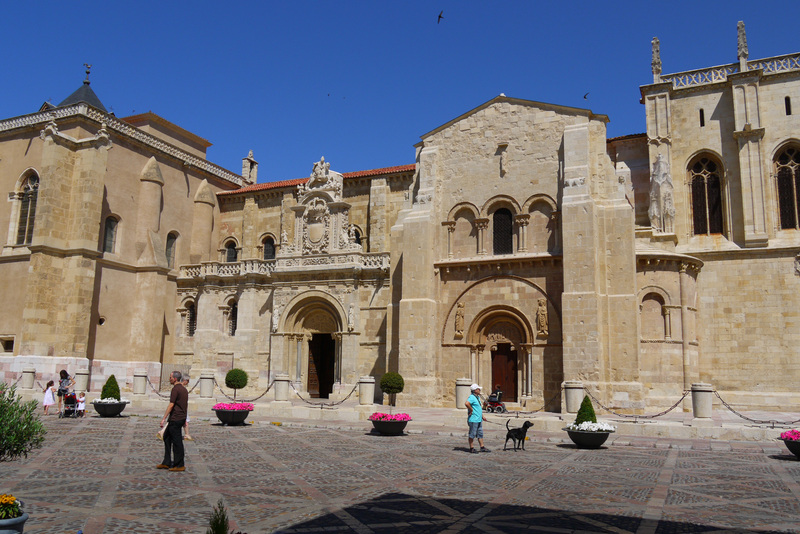 Opening Times: Santa María de León Cathedral: Oct – Apr: Mon – Sat: 9.30 a.m. – 1.30 p.m., 4 p.m. – 7 p.m. Sun: 9.30 a.m. – 2 p.m. May – Sept: Mon – Fri: 9.30 a.m. – 1.30 p.m., 4 p.m. – 8 p.m. Sat: 9.30 a.m. – 12 a.m., 2 p.m. – 6 p.m. Sun: 9.30 a.m. – 11 a.m., 2 p.m. – 8 p.m. Museum & Cloister: Oct – Apr: Mon – Sat: 10 a.m. – 1.30 p.m., 4 p.m. – 7 p.m. May – Sept: Mon – Fri: 9.30 a.m. – 1.30 p.m., 4 p.m. – 8 p.m. 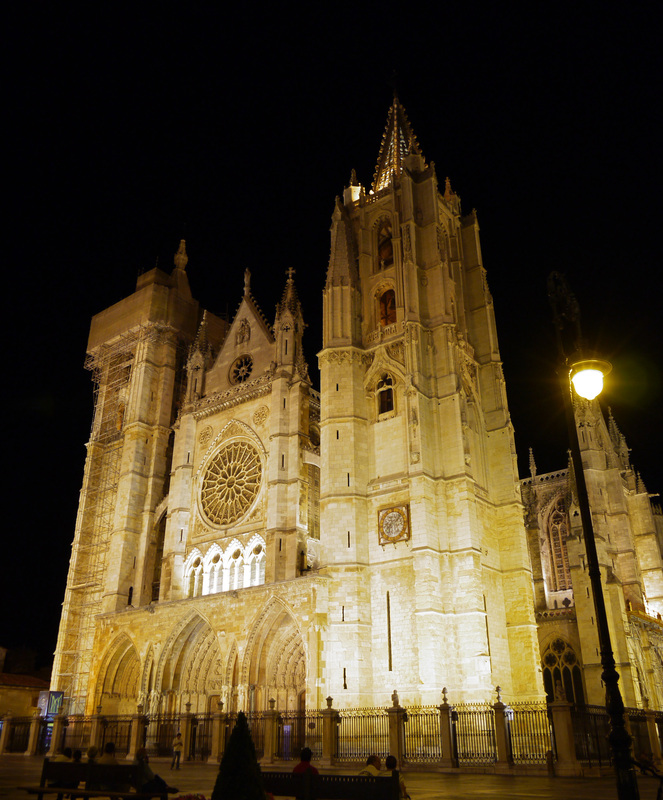 Sat: 9.30 a.m. – 12 a.m., 2 p.m. – 6 p.m., Sun: 10 a.m. – 11 a.m., 4 p.m. – 7 p.m.
Information: Santa María de León Cathedral is a masterpiece of the Gothic style and took over three centuries to complete. The cathedral is a playground of light and its stain glass windows are among the most impressive in the world, pouring colour around the vast space. Probably the finest example of Gothic architecture in all of Spain, it was modelled on the Gothic cathedrals of France especially Rheims Cathedral and St-Denis Basilica. The western façade is particularly striking and is flanked by two towers and contains some beautifully made Gothic portals and a large Catherine window. Within the Cathedral itself, 125 medieval stained glass windows illuminate a French Gothic interior with three aisles, a short transept, and a five-bay choir. The stunning effect of the rays of sunlight crashing through the stained glass windows onto the lightly coloured stone has earned the temple the nickname “House of Light.”. The north transept adjoins to the 13th and 14th century cloister, with notable features being the Romanesque and Gothic tombs, and the, now faded, but finely detailed frescoes. The Cathedral Museum (Museo Catedralicio Diocesano de León) houses nearly 1,500 works of art from prehistoric times to the 18th century with a special focus on religious art including over 50 sculptures of the Virgin Mary. Opening Times: Basilica: 7.30a.m. – 11 p.m. Museum & Pantheon:Sept – Jun: Mon – Sat: 10 a.m. – 1.15 p.m. & 4 p.m. – 6.30 p.m., Sun: 10 a.m. – 1.15 p.m. Jul & Aug: Mon – Sat: 10 a.m. – 8 p.m., Sun: 10 a.m. – 2 p.m.
Information: Built in the Romanesque style but with later Gothic additions the Basilica has been the site of Christian worship since the 10th century. Notable features include the carved tympanum of the Puerta del Cordero which depicts the sacrifice of Abraham. The Royal Pantheon is the funeral chapel of the kings of León and is noteworthy for 12th century painted murals which remain in an exceptional state of preservation. The museum holds 300 works from the Medieval period, numerous manuscripts as well as a mozarabic bible dating back to 960 and a Latin version transcribed in the 7th Century. Opening Times:Oct – Jun: Mon – Sat: 10 a.m. – 2 p.m. & 4 p.m. – 7 p.m. Sun: 10 a.m. – 2 p.m. Jul – Sep: Mon – Sat: 10 a.m. – 2 p.m. & 5 p.m. – 8 p.m. Sun: 10 a.m. – 2 p.m.
Information: The museum of León, is housed in two separate buildings: one in the Convent of St. Marcus and the other in the Edificio Pallarés. 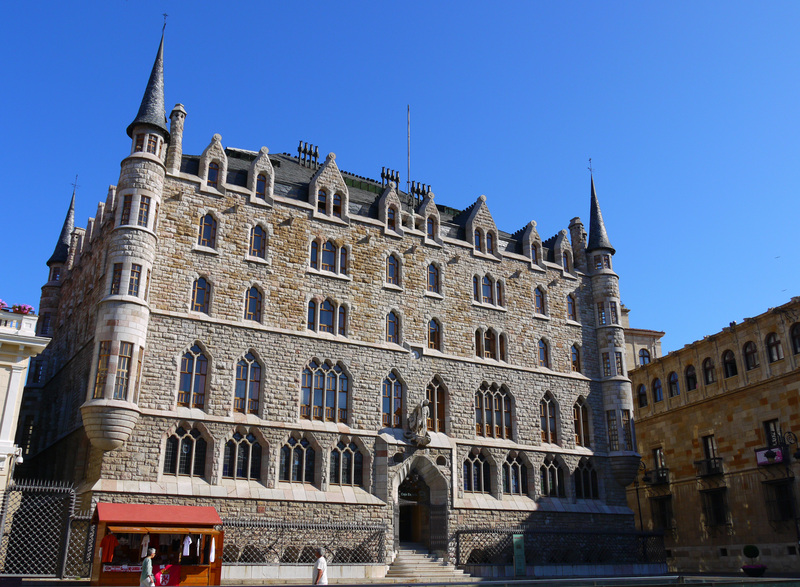 It offers a collection covering all historic periods of human activity in León, from the Palaeolithic right through to modern times. Highlights include exhibits on the Romanisation of the area and the Middle Ages, as well as its archive of coins and inscriptions. Opening Times: Oct 1st – Jun 30th: Mon – Fri: 9 a.m. – 2.30 p.m. & 4.30 p.m. – 6.30 p.m., Jul 1st – Sep 30th: Mon – Sun: 10 a.m. – 2 p.m. & 4 p.m. – 8 p.m.
Information: Built in the 16th century in the Renassiance style for the Guzman family, it is a three-storey high building with square towers at the four corners and is arranged around a two-level courtyard. Notable features include the façade and its round arches gallery on the top floor. Today the building is the seat of the Provincial Government of León. Information: Casa de los Botines, built in 1892-1893, is a Modernist building designed by the Catalan architect Antoni Gaudí and is one of only 3 buildings by the revered father of modernism outside of Catalonia. Originally constructed for his rich patron Carlos Güell, Gaudí wanted to pay tribute to León’s emblematic buildings and so he designed a building with a medieval feel but with numerous neo-Gothic characteristics. Today the building is the headquarters of Caja España, a savings bank, and the building can’t be visited in its interior. Opening Times: Mon – Fri: 9.30 a.m. – 1.30 p.m. & 6.30 p.m. – 9 p.m., Sun: 10.30 a.m. – 2 p.m. & 6.30 p.m. – 9 p.m.
Information: Constructed between 1588 and 1625 on the site of a 10th century church, the Church of San Marcelo is devoted to the patron saint of the town, a legionnaire called Marcellus, who was beheaded in 298 for becoming a Christian. Notable features include the magnificent altarpiece and several secondary retables with wonderful sculptures in the Baroque style by Gregorio Fernandez. 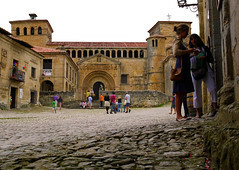 Information: Constructed as a hospital for pilgrims on the road to Santiago de Compostela. 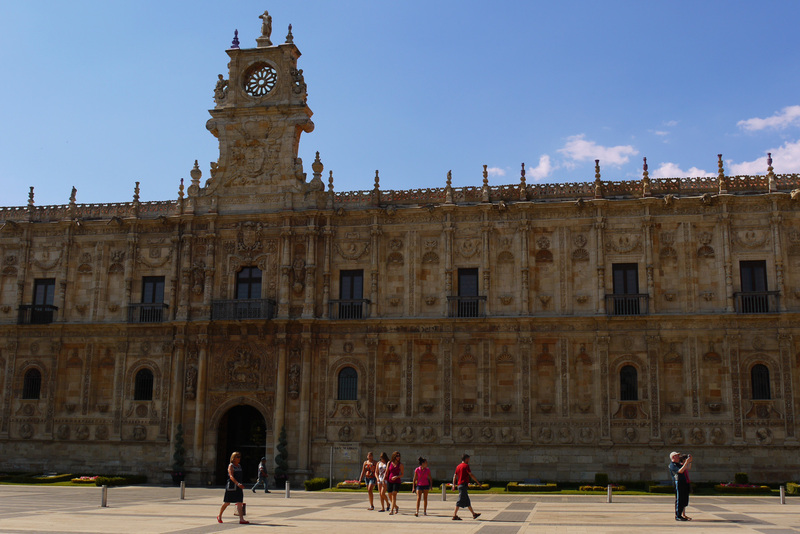 The Convent of San Marcos is now a luxury hotel, contains a consecrated church and museum, and is one of the most important Renaissance buildings in the city. The most stunning feature of the former convent is its magnificent Baroque façade which is a refined expression of the Plateresque style. Opening Times:Mon – Fri: 11 a.m. – 2 p.m. & 5 p.m. – 8 p.m. Sat & Sun: 11 a.m. – 3 p.m. & 5 p.m. – 9 p.m.
Information: Opened in 2005 and designed by Emilio Muñon and Luis Moreno, the contemporary art museum has 5 exhibition halls and contains more than 1650 pieces over an area of more than 21,000 m2. 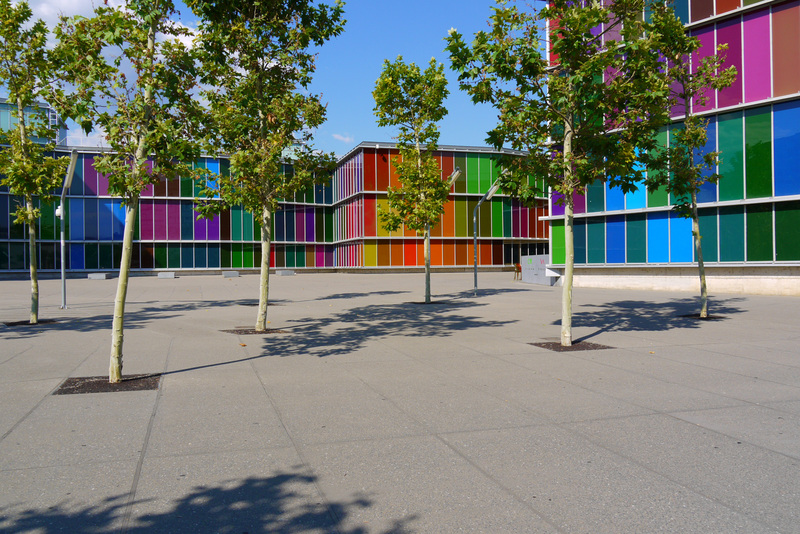 The multicoloured main façade is a curiously modern representation of the stained-glass windows of the Cathedral of León. Gallery | This entry was posted in *Guides*, *Photos*, A dedo por la Península Ibérica 2012, City guides, Free Walking Tour, Monuments, Spain, _trips_ and tagged backpacking, guide, monuments, photography, Spain, travel, travelling, walking tour. Bookmark the permalink.